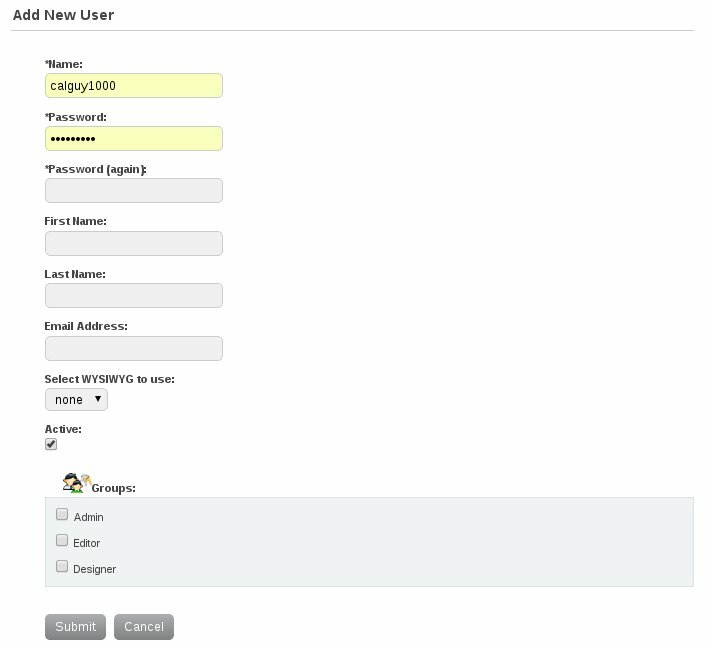 From this form you can add, edit, or delete administrative user accounts, as well as manage the group membership of individual users. Additionally, you can quickly toggle the active state of individual users (assuming your administrative user account has sufficient permission). The user account with the id of 1 (The account created during the installation process) is special compared to all others. Users logged in to this account will automatically pass all permissions checks and will therefore be allowed total access to the system. If your account has sufficient permission, you can create a new admin user account by clicking on the "Add New User" link in the user list. To edit an existing user account you can click on the username link, or the edit icon in each user row. When adding a new user account or editing an existing one, you are asked for the normal information (username, password, confirm the password, email address, etc). Additionally, you can specify which groups the user can be a member of. Marking a user as inactive will create the user record, but prevent that user from being able to login to the CMSMS admin console. The username must consist of only valid alphanumeric characters, the dot, underscore and space. The email address property must either be empty, or consist of a valid email address.